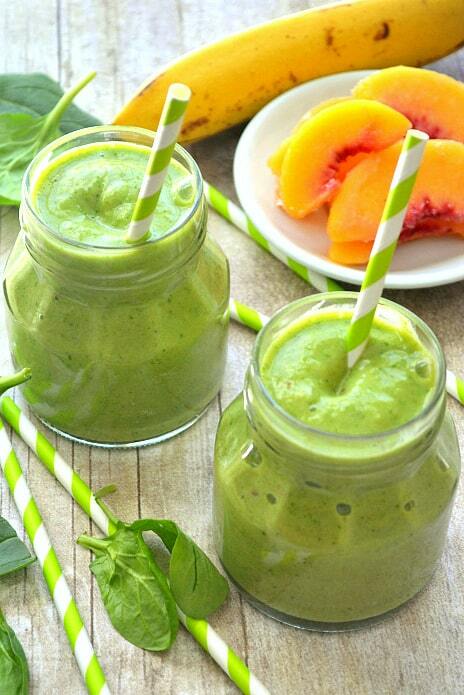 This Pineapple Peach Mango Green Smoothie is a delicious taste of the tropics! 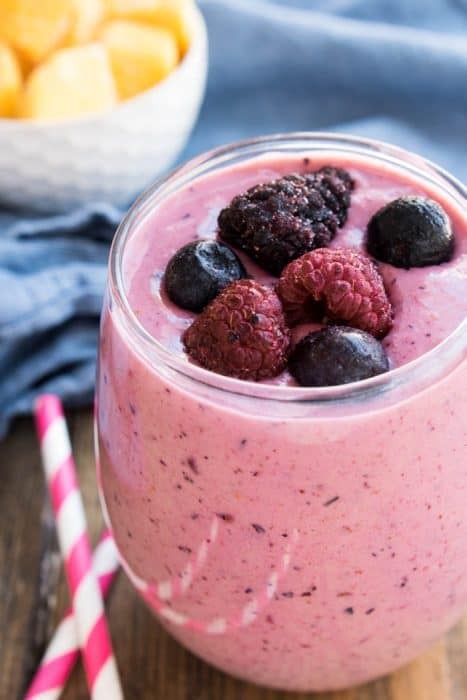 This breakfast smoothie is flavor-packed and a perfect snack for any time of day! Well….we are officially gearing up for St. Patrick’s Day around here! The red and pink have all come down and the green has all come out. We waste no time between holidays, really…and it makes sense. When you do as much for each holiday as we do, and when you start a month ahead of time, by the time the holiday actually comes and goes you’re pretty much ready for it to be done! It’s a good metaphor for life, if you think about it. Live things to the fullest and you won’t be so sad when it’s time to move on….? I’m not sure if it’s pregnancy or what, but this is something I’ve been really struggling with lately. How quickly time flies! I can’t believe that Ellia is already reading chapter books or that Greta is already losing teeth or that Nora is speaking in full sentences and telling me that things are “inappropriate.” I can’t believe how quickly they’re all growing up, how quickly we are moving from one phase of life to another! People have always told me that I would feel this way. When Ellia was a colicky baby and I couldn’t wait for her to grow out of it, I would always hear, “Just wait…it goes quickly.” Or when I’ve struggled to keep my patience with Greta’s roller coaster moods, I’ve always been told, “Before you know it, you’ll be dealing with much bigger issues.” Or when Nora has made our grocery trip take ten times as long because she’s insisted on pushing the cart and dancing through the aisles, I’ve had countless people tell me, “Enjoy this. It won’t last forever.” How right they have all been! 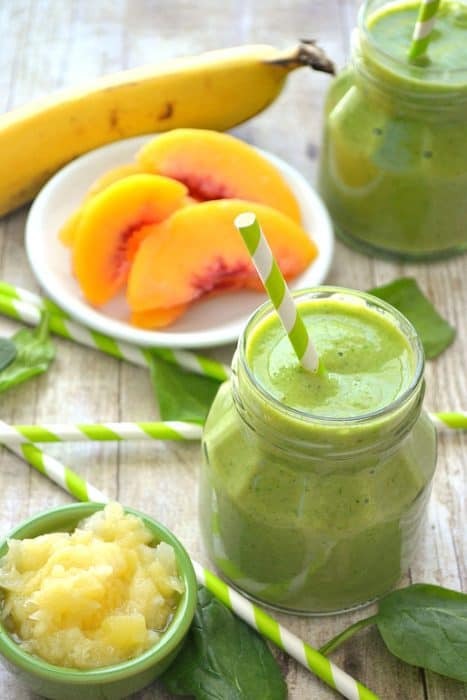 This Pineapple Peach Mango Green Smoothie is a delicious taste of the tropics! 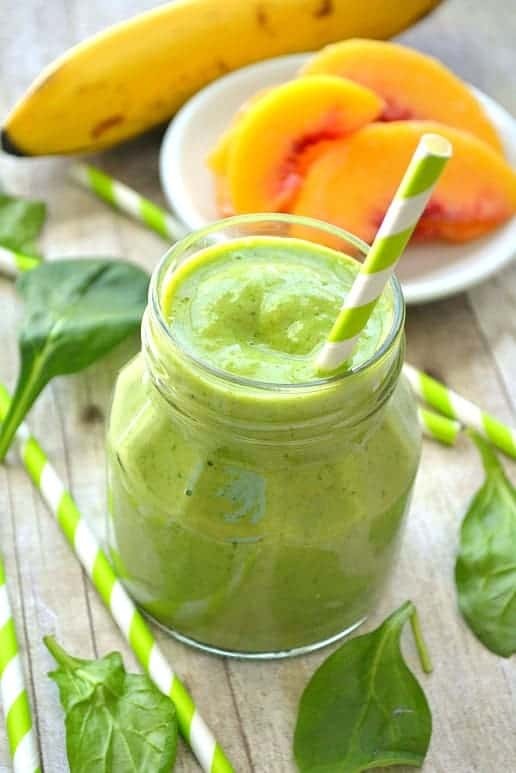 Loaded with peaches, mango, pineapple juice, bananas, and spinach....this smoothie is flavor-packed and perfect for any time of day! Looking for more delicious smoothie recipes?? My friends at A Dish of Daily Life have a wonderful Strawberry and Oatmeal Smoothie you need to try! So much better for you than a shamrock shake! Love this combination Cathy. Looks so light and fresh! Perfect way to start your morning. Pinned! 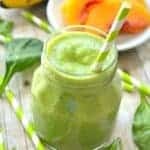 Cathy, I love smoothies and this recipe looks amazing…and the spinach definitely adds some nutritional punch! This looks so springy and refreshing! I need this as it is a raging blizzard outside! 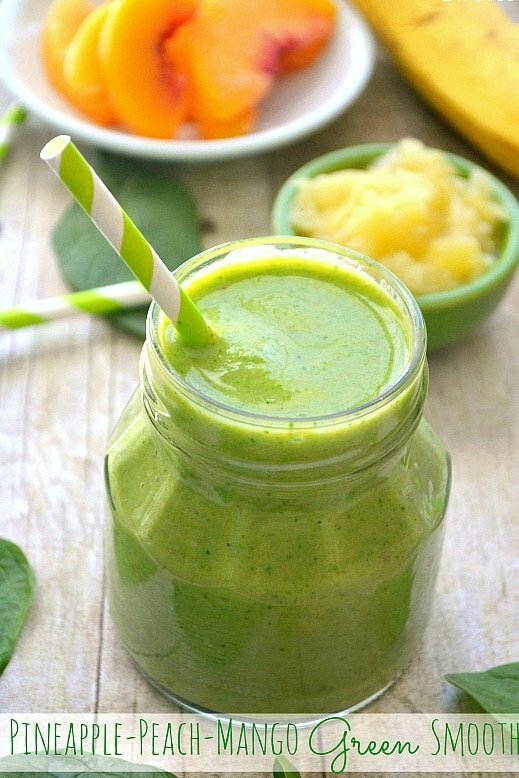 I love green smoothies and this tropical version sounds amazing with the mango and pineapples! Love this and sounds like a great way start off your morning on the right foot 🙂 Time definitely seems to be flying by lately – can’t believe how fast the little ones grow. It’s just nuts, isn’t it Kelly? I try to stop and take note whenever I can without getting overwhelmed by all of it! Thanks so much for your sweet comment….we love smoothies too and this is one of our new favorites! Your photos make it look like summer’s already here! Beautiful! I’m doing the same, Shannon! Every time the sun is shining I try to tell myself it’s warm outside…. :) I must say, even tiny glimpses of anything but a deep freeze are helpful! And this smoothie is definitely helpful, too!! YUM! Looks so health and refreshing! We love a good smoothie at our house. Can’t wait to try it. Enjoy your day! Thanks, Brooke! We love smoothies too….I’m pretty sure my oldest daughter would be perfectly content with a smoothie every single morning!! 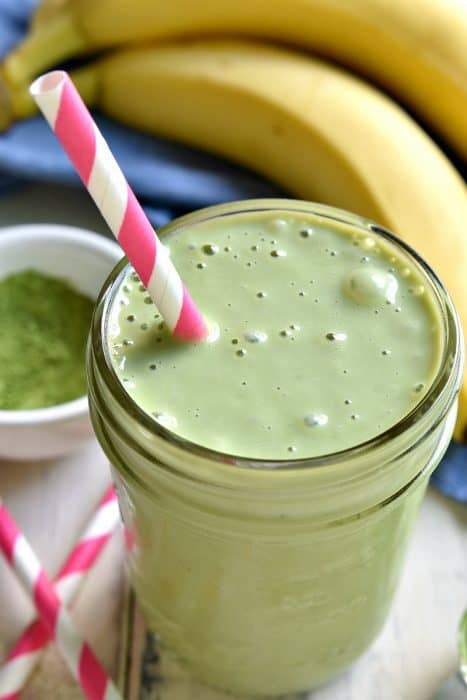 I love green smoothies and whenever I can find new recipes to mix it up is great! Looks so yummy… Featuring you tomorrow my sweet friend! 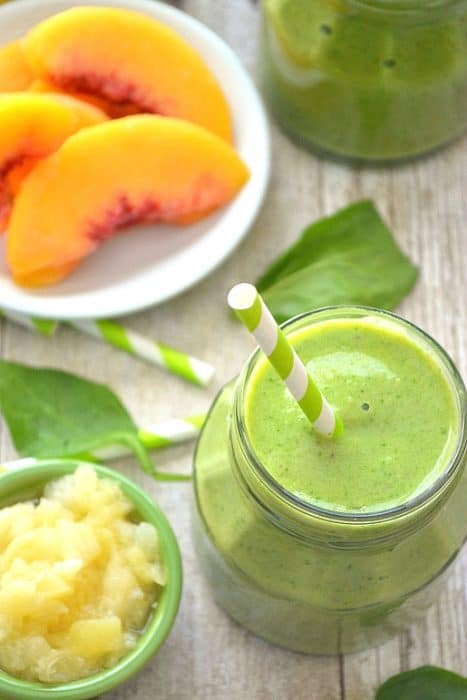 This smoothie has some of my favorite ingredients! I see this happening in the near future! Thanks, Jamie! Mine too….and I love the fact that the spinach is completely masked. I mean – who wants to drink spinach, really?? This would make a great pick me drink for the afternoon! Which I need! Haha – don’t we all!! This is one of my absolute favorites….and my kids love it as an after school snack!